The Korean Demilitarized Zone, 1970s: A battered corpse is found a few feet north of the line dividing North and South Korea. 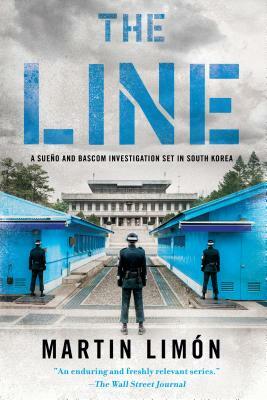 When 8th Army CID Agents George Sueño and Ernie Bascom pull the body to the South Korean side on orders from their superiors, they have no idea of the international conflict their small action will spark. Before war breaks out, they must discover who killed Corporal Noh Jong-bei, a young Korean soldier working with the US Army. The murderer could be from either side of the DMZ. But without cooperation between the governments involved, how can two US military agents interrogate North Korean witnesses? What George and Ernie discover gets them pulled off the case, but fearing they’ve put the wrong man behind bars, they disobey orders in an attempt to discover the truth. Martin Limón retired from military service after twenty years in the US Army, including ten years in Korea. He is the author of twelve previous Sueño and Bascom investigations: Jade Lady Burning, Slicky Boys, Buddha’s Money, The Door to Bitterness, The Wandering Ghost, GI Bones, Mr. Kill, The Joy Brigade, The Iron Sickle, The Ville Rat, Ping-Pong Heart, and The Nine-Tailed Fox, as well as the short story collection Nightmare Range. He lives near Seattle. "Limón's fiction comes from personal experience, with some obvious parallels between his own life and main protagonist Sueño's. As well as sharing a Hispanic heritage, Limón also served in Korea, first arriving in 1968 . . . Rare foreign fiction set in Korea." "Superb . . . Limón has never been better at incorporating a logical mystery plot into the politics of his chosen time and place." "One of the most powerful episodes in an always-strong series." "[The Line] entertains with its easy banter and fascinates with deep insight into its precise historical moment." "I have read every Limón book since 1992’s Jade Lady Burning, and I have every intention of continuing to do so; they are that good." "Acclaimed author and army vet Martin Limón again hits the target with his 13th military murder mystery." “A fast-paced, action-packed yarn that will keep you glued to your seat from the first page to the last." “A fast-paced, action-packed yarn that will keep you glued to your seat from the first page to the last.